Whittaker Chambers lauded Russell Kirk’s The Conservative Mind as “the most important book of the twentieth century.” It is a fitting time to remember his remark, as this year is Russell Kirk’s centenary. To mark the occasion, The New Criterion held a one-day conference in New York to discuss his contribution to our understanding of the challenges that continue to face us. The great impresario of “permanent things,” Kirk is an increasingly important voice for our age, a writer that we at The New Criterion turn to often for his clarity and sobriety. The New Criterion is a voice of tradition crying in the wilderness of presentism. Perhaps the biggest challenge revolves around that phrase, “permanent things.” Even in Kirk’s heyday, in the 1950s and 1960s when he was writing landmark books such as The Conservative Mind, our culture was beset by a voracious addiction to the ephemeral. And how much more acute is that addiction today, when our deliberations are increasingly compressed into an unstill point of Twitter’s 280 characters. I do not believe Eliot had prescient insight into twenty-first-century technology. But I do think it likely that he peered deeply into the human soul and understood a perpetual source of our spiritual waywardness. In an increasingly manic world—“distracted,” as T. S. Eliot put it, “from distraction by distraction”—the enduring criticism of The New Criterion provides both an anchor and a springboard, linking readers to an enabling past, while also elevating them to a more cognizant future. Poets are not prophets, but Eliot came close. You likely know that The New Criterion was named in homage to Eliot and his magazine The Criterion, one of the most distinguished and influential cultural reviews of the last century. The New Criterion endeavors to live up to Eliot’s affirmation of “permanent things” in the face of the blandishments of the transient. But more generally, The New Criterion follows Eliot and Kirk in the effort to preserve the enabling values of Western civilization against the promiscuous sources of dissolution and civilizational atrophy. Now in its thirty-seventh year (it is sobering to recall that Eliot’s Criterion enjoyed a tenure of only seventeen years), The New Criterion is a voice of tradition crying in the wilderness of presentism—the strange conviction that all our yesterdays were dispensable props in the formulation of the apex of history, which is now. It is the task of thoughtful reflection to disabuse us of that recipe for existential nullity. This, in a nutshell, is our vocation: to stand up for the living pulse of the past and to show how who we are now is deeply interwoven with who we have been. Fifty years hence, everyone will have forgotten about the fleeting chirps of the commentariat. But libraries will still have bound copies of The New Criterion, as they have had since our founding in 1982. The magazine itself serves as a permanent record of how some of the finest minds in our culture thought about the major figures in our world. Perfect bound, and with an index published every June as a summary of the season, the printed magazine has always been made to pass the test of time. Our growing readership—online and in print—is a testament to the importance of this work. We are pleased that this sense for longevity thrives even in our online presence. Our entire archive is available online for subscribers to read and share at no extra cost. Interestingly, in any given month, some of our most widely read essays were first published ten, twenty, or even thirty years ago. Whether it is “How civilizations fall,” by Kenneth Minogue (April 2001), “Stealing history,” by Donald Kagan (March 1996), or “Why I became a conservative,” by Roger Scruton (February 2003), these extraordinary essays are being found and shared by hundreds of thousands of readers. This renewed interest in The New Criterion’s archive is due, in part, to our new weekly “Archives Newsletter,” another recent innovation. This is a free email, one of several newsletters we now offer, collecting a handful of essays from past issues. Organized around a particular theme, sometimes tied to recent events, the newsletter has helped our readership dip a toe into our back catalogue of 360 issues and counting. With nearly ten thousand subscribers, the newsletter also offers a way for readers old and new to discover the magazine even without a subscription. In an era defined, more and more, by the timely, The New Criterion looks to the timeless. This is a journal created not just for a given month. 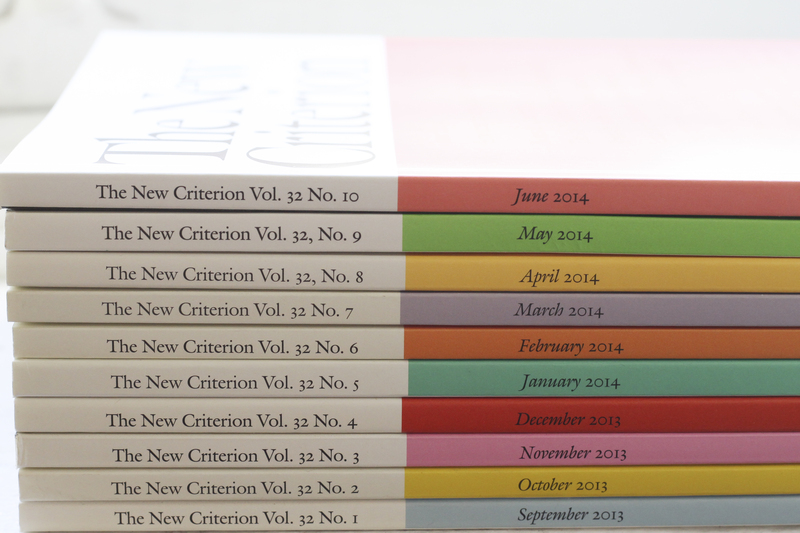 The essays of The New Criterion are meant for every month. And the magazine’s cultural mission now extends far beyond the printed page. Our editors host monthly podcasts. Our website publishes more web-exclusive essays than ever. Our digital Dispatch section has allowed us to review operas, plays, and art exhibitions farther afield, and our weekly newsletters have helped us reach readers in all corners of the globe. I hope you’ll find the time to explore the additional work that our team produces each week. By venturing further into the digital space, we endeavor to foster a love of permanence even amidst so much twittering impermanence. Our growing readership—online and in print—is a testament to the importance of this work. Can you help us to continue and expand our efforts at preserving the great inheritance of Western civilization—that inheritance that fills the pages of each issue of The New Criterion—and now the digital pages of newcriterion.com as well? A gift of $100, $250, $500, or even $750 will ensure that generations of readers will have astute and lucid cultural criticism right at their fingertips. An extraordinarily generous contribution of $2,000 or more instills you as a member of our Friends of The New Criterion program. The Friends of The New Criterion is a dedicated group of readers who donate their time, effort, intellect, and money to support this magazine and the evergreen values that it was founded to protect. A group that lives this mission in practice, the Friends meet several times a year in forums formal and informal to hear reflections by the magazine’s leading critics, attend panel discussions, and celebrate important book releases. Each event includes a luncheon, a cocktail reception, or a dinner. The Friends of The New Criterion has grown leaps and bounds since it was first conceived in 2000, and it is now the ideal way for people to meet others who share a love for The New Criterion. Your support would ensure that generations of readers will have astute and lucid cultural criticism right at their fingertips. The Friends have gathered with us for just such camaraderie on a number of occasions over the past year. To name just a few that you might find intriguing: We met at the Yale Club to discuss and hear a panel on the conservative response to populism. We heard from the curator Carmen Bambach, who gave us a private tour of her acclaimed exhibition “Michelangelo: Divine Draftsman and Designer” at the Metropolitan Museum of Art. We gathered to celebrate Moira Egan’s new book of poetry, Synæsthesium—the winner of the 2017 New Criterion Poetry Prize. And to celebrate the opening and closing of our editorial calendar and the Christmas holiday, we welcomed our authors and supporters to our office for seasonal revelries. By joining the Friends of The New Criterion with a generous gift of $2,000, you secure invitations to these exciting cultural and intellectual opportunities. We would love to have you join us for some of these events next year! The New Criterion, in its many forms, aspires to be a permanent thing itself—a culture of serious criticism that endures beyond the present discontents and provides a lasting record for posterity. I thank you for aiding our efforts, and I hope you’ll consider continuing your gracious support and enjoying our authors’ many outstanding contributions to preserving and advancing the timeless ideals of our Western civilization. The New Criterion is published by The Foundation for Cultural Review, 900 Broadway, New York, NY 10003, a nonprofit public foundation as described in Section 501 (c) (3) of the Internal Revenue Code, which solicits and accepts contributions from a wide range of sources, including public and private foundations, corporations, and the general public. Contributions to The New Criterion are tax deductible according to the provisions of the Internal Revenue Code. All gifts in excess of $75 will be acknowledged with a written disclosure statement describing the “quid pro quo” deductibility under section 6115 of the Internal Revenue Code.